I havent had a chance to update my blog lately, time has been flying by! I got really sick a few weeks ago with a kidney infection and ended up in the ER. I have been recovering since then, but Im finally feeling better! We had a doctors appointment a few weeks ago where we talked about our options to ensure Dans presence in the delivery room. Our doctor agreed that I should be induced the week before my due date, Im guessing (with really nothing to back it up) we will have the baby between May 15th and the 19th! This means that I only have 11 weeks left! We are moving this weekend to a townhome in Saratoga Springs (west of Lehi). Im excited we will be a little closer to my sisters, but hard that we wont be just down the street from the Andersons! Now that we have somewhere to bring the baby home to I feel we are almost ready (Im really ready to be done)... besides THE NAME! We are having a really difficult time deciding on something that fits. We really want to use the middle name Joseph (Dans middle name) but its hard to find something we like that flows well, any suggestions!?!?! 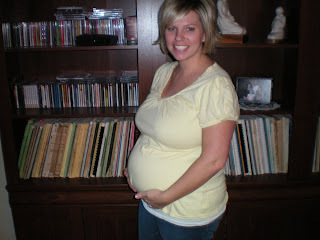 Lastly, here is a picture of me from this week, so right before 28 weeks. Im feeling really big even though Ive only gained 8 pounds! 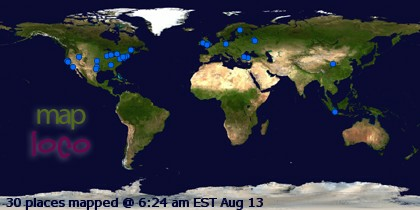 Hopefully I can blog a little sooner this next time so its not a big jumble of info thrown at all of you! We had our second ultrasound about 2 weeks ago, and Im finally getting around to putting a picture of our little guy on! For those of you who cant figure it out (like my Mother who looked at the picture really confused!) 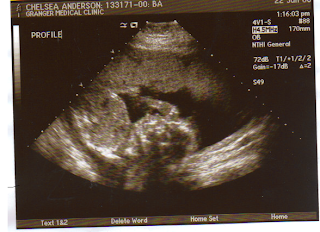 his head is in the middle, tummy toward the left side, and his hand is up on his nose. He is a total wiggle worm and is constantly moving around... this doesnt bother me, YET! He had the hiccups while we were in the ultrasound, I cant feel them but they were really cute to watch. p.s. Liz- I wrote down the questions and plan to do that next!